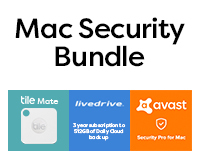 3 years subscription to protect your Mac against Malware, Virus and Ransomware. This Pro version also detects Wi-Fi intrusions. 3 Years Subscription of seamless non-intrusive back up to the Cloud. Restore a file easily. Use the iPhone App for status updates. Keep track of keys, bags and anything else by easily attaching the Bluetooth Tile Mate. 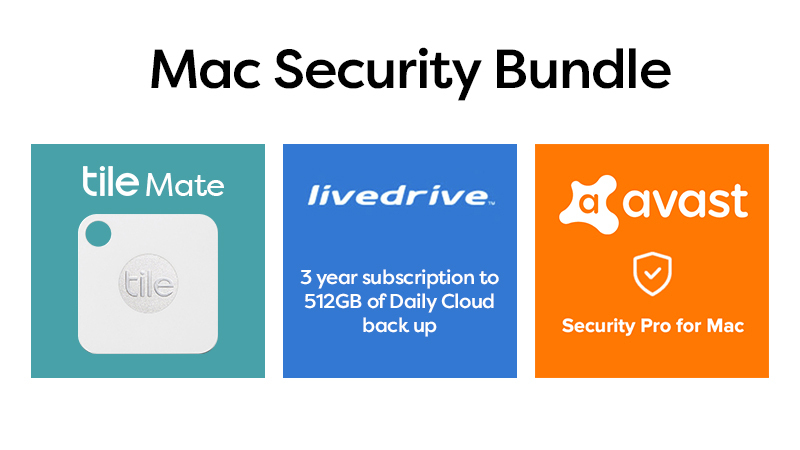 Add our Security Bundle and protect yourself and your Mac. We have bundled up our favourite tried and tested extras to ensure that you can take full advantage of your Apple devices without fear the of losing data, personal information or the product itself. Firstly, this bundle allows you to keep track of your Mac product by attaching the Tile Mate to your Notebook or Carry Case. The Tile Mate has a Bluetooth range of 150 ft or 45 m which is subject to the environment and includes an interchangeable battery to provide you with a long life solution. Fear not, Tiles are only visible to their registered user unless you mark them as lost, this will allow other phones to find it, but they do so anonymously. Secondly, this bundle allows you to save your documents to the Livedrive Briefcase folder in the Cloud and then access and edit them securely from any device. Livedrive automatically uploads your files to a bank-level secure UK datacentre with 24/7 physical security and intrusion prevention. If you lose or break a computer, tablet, or phone you can easily restore the files to a new device. Leasing your new Mac Product has never been so secure!